Today we are discussing the body style Hourglass. An Hourglass shape is very curvy with the bust and hips being about the same measurement and a very defined waistline. Many, many dress styles look great on this body style, with just a few things to avoid. 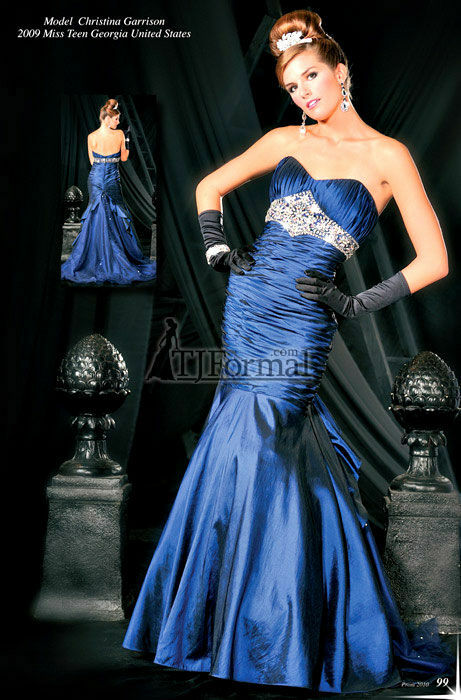 This TJ Formal Exclusive 2010 Prom Dress BB1556 has a strapless v-neck and mermaid skirt and would is just the type of dress someone with an hourglass style should be wearing. Features to avoid if you have an Hourglass body Styles: Gathered, Scoop or Square necklines. Circle or Ball Gown skirts. Awesome, good to know, thanks!! I always wondered if I could wear a mermaid dress..